Part of what must happen in order to have a comfortable sleeping environment is to get rid of extraneous noise. This can be noise from nearby traffic or noise from others in your home. One way to improve your sleep environment is to wear earplugs when you go to bed. 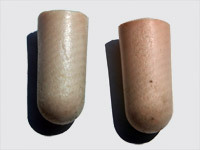 There are many types of different ear plugs to choose from, some of which can be uncomfortable to wear, while others don’t block out enough noise. These are earplugs that create a white noise inside your ears that act like outside white noise machines. They are made from hard plastic, which can be uncomfortable to wear if you sleep on your side. The white noise doesn’t deter you from hearing certain higher pitched sounds and they are difficult to clean. These earplugs for sleeping are specially fitted to your ears so one would think that they are comfortable. In reality, the hard plastic earplug you get with this device can make the ear canal sore to the touch after wearing to for a period of time. They are also not very effective in blocking out noise. These are sticky, waxy ear plugs you form fit inside your external ear canal. They are extremely effective and comfortable; however, because these are somewhat sticky, they get dirty quite easily and need to be replaced. Fortunately they cost less than $40 for a pair.. These ear plugs for sleeping are silicone stopples that fit on the outside of your ear canal and mold differently any time you take them out and replace them again. They are inexpensive but can fall out quickly and can get dirt stuck to the silicone putty. These just slip into your ear canal without having to be rolled snug enough to fit. They tend to be less effective when compared to other ear plug devices yet are durable and easy to use for milder problems of noise affecting sleep. These are made from foam and are very effective if you first make the fat cylinders into skinny ones. The thin cylinders are then quickly stuffed into the ear canal so that they can expand to fit the ear canal perfectly. These are really cheap at 6 pair for under $3. 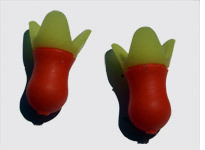 These are great cylindrical earplugs that come in a bright orange color. Like other cylindrical earplugs, you must first roll or squeeze them into a tiny cylinder that is stuffed into the ear canal. They cost about $1 a pair. Similar earplugs to straight foam earplugs, called Hearos Ultimate Softness ear plugs, are one size fits all and are made of polyurethane, which is more comfortable than simple foam earplugs. They are also about $1 per pair. 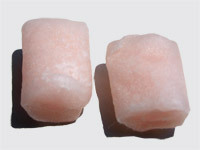 Earplugs serve many purposes, including blocking out unintended or annoying noise, such as that of a snoring partner or traffic noises out of your bedroom window. Not all earplugs are created alike and there are many differences in how well they block out noise. Some will block out only those low decibel noises but will awaken you if you experience a high pitched or particularly loud sound. Earplugs also differ in the degree of comfort one experiences while wearing them. 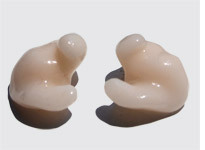 Those that are molded to your ear by a specialist can be comfortable and effective but, because they tend to be made of hard plastic, sleeping on your side might be too uncomfortable. 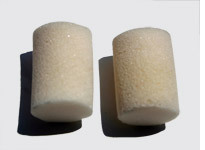 Cheap, foam ear plugs are extremely comfortable and have the added benefit of being very inexpensive. If you go for the cheaper forms of earplugs, make sure they are made of comfortable material that won’t put undue pressure on the inner walls of the ear canal. You may need to try out different earplugs to see which ones are more effective for you. If you have sensitive ear canals, you might choose those made of soft polyurethane material that can be rolled into thin cylinders before stuffing them into your ear canals. If efficacy is what you are looking for, try on different kinds of earplugs that block out the noises you are likely to experience during the night. Fortunately, most of theses are inexpensive so you aren’t out much money by trying on different types of earplugs. 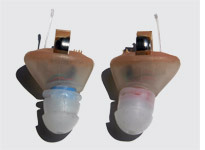 They can be configured to fit your ears by hearing specialists who know about how to form fit earplugs to fit your ears. They can also be purchased at various pharmacies, although you may not find the exact brand listed above. If ear plugs are a part of your working life, you might want to borrow a pair to see if they are comfortable and effective when worn at night. Is it safe to sleep with ear plugs? Wearing earplugs are mostly safe. However, some complications of wearing ear plugs at night include irritation of the ear canal, which can form open sores. You also tend not to clear out earwax as easily when you are wearing them at night time and your doctor may need to flush out your ear canals of wax on a periodic basis. There are advantages to buying cheaper ones in bulk, either at a pharmacy or online. This means that, when your earplugs become dirty, you can simply throw them away and select another pair. There will usually be at least one type of ear plug that will fit well to your ear canals, protect you from excessive noise problems at night and will be comfortable to wear.